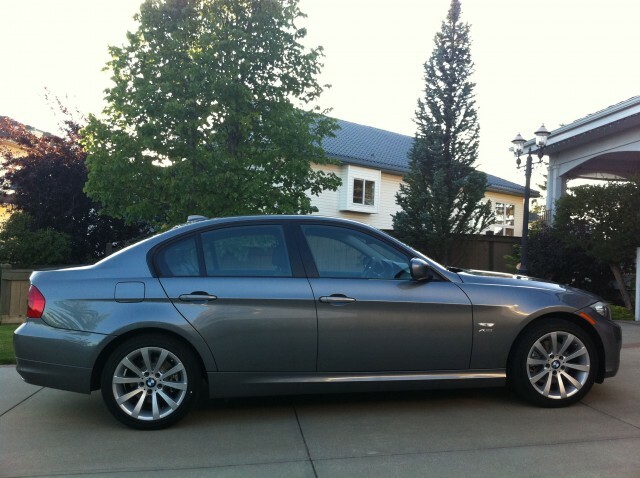 If you’re looking for a review on the all-new 2013 328i, check it out here. I get it. I get that the 3-series is BMW’s bread and butter, and I get that people like it. I recently got to spend a day with a brand new 328i xDrive sedan – only 60 km on the odometer. I’d rather have spent a week, as I have with my other review vehicles, but beggars can’t be choosers. I was interested in seeing why it is that the automotive press invariably waxes poetic about this car, in any iteration. The 328i xDrive is the lower-middle of the road for the ubiquitous 3-series. Lower down the line, you’ll find the 323i, higher up you’ll find the 335i along with it’s sportier twin, the 335iS and at the pinnacle, there’s the mother of all 3-series cars – the thunderous, I’d-give-my-kidney-for-one, fire-breathing, race-bred M3. As BMW has made it clear that this is the last naturally aspirated V8 M3 we’ll see, it makes me even more sad that I don’t have one. But that’s a different post altogether. So we have a compact 4-door, powered by a 3.0 Litre inline-6, making 230 HP @ 6500 RPM and 200 lb-ft of torque @ 2750 RPM all while sipping expensive premium gasoline. The word “sipping” is a bit rich, because this car isn’t the most fuel efficient thing I’ve ever driven. It’s not the planet-wilting Ford Raptor I reviewed earlier, getting 10-ish mpg, to be sure, but nonetheless, it’s rated at only 13.8 L/100 km (17 mpg) in the city and 9 L/100 km (26 mpg) on the highway. Those aren’t great numbers anymore by today’s standards, they’re not horrible, but I wouldn’t be jumping up and down to announce them and I wouldn’t be writing home about them. I’m certain the fact that the 3-series has gradually put on the pounds, this one tipping the scales at well over 3600 pounds, has a lot to do with that. Yes, the all-wheel drive, the fat tires, the additional safety gear that has been added over the years, the endless luxury appointments – they all contribute a pound here and there and it adds up. Certainly nobody would be ready to give up any of those, and that leaves us with a porky little 3-series compared to where its roots lie. On an efficiency note, I averaged 12.5 L/100 km (18.8 mpg) while I had it, with mostly conservative city and some freeway driving. The 328i xDrive starts around CDN $39,950 – equipped similarly to this one, you’d be looking at a number closer to CDN $45,000. Let’s talk about driving – BMW touts their position as a driving machine, and they refer to joy whenever they can. So – was it a joy to drive? Was it all that? Sort of. The 328i felt very solid, from the moment I got in and closed the door. The inline-6 gave me BMW’s trademark snort when being fired up, and would definitely let you know it’s there when you step on it – I’ve always loved the mechanical sound of BMW’s inline-6s. Throaty, sporty, a little brash, just letting you know they’re there. 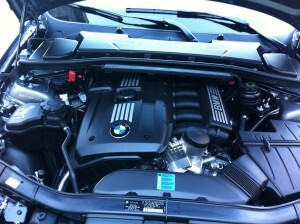 The engine makes nice sounds, but remains nicely muted when cruising. The power is pushed through a 6-speed automatic. No dual-clutch, and no paddles. It has the traditional BMW M/S mode – you can snick the lever to the left, into Sport mode, which will hold gears longer and make the car more responsive. While the lever is over there, you can flick it up and down, to manually change gears if you see fit to do that. I would use the word smooth to describe the driving experience. Everything was smooth, and nothing was offensive. And maybe I felt that was a bit of a letdown. It’s tough to explain, but maybe I wanted a sharper driving experience. Somehow this car didn’t feel as fast as it is on paper – 0-60 is just fine (6.2 seconds, I believe), but the transmission always seemed to hunt for higher gears, and even starting from a standstill seemed more sluggish than I expected. Don’t get me wrong – it’s NOT a sluggish car, but it felt like one at times. The car felt heavier in city driving than it really is, but this changed at freeway speeds – it’s clear that these cars prefer the open road. The handling is fantastic. Balanced, competent, solid. I’d say the suspension is definitely taut – but refined. It soaks up bumps, expansion joints, and the like well, but stays flat around city corners and absolutely loves sweeping corners. I’ve spent significant amounts of time in a number of 5-series BMWs and the suspension in this car is a different animal altogether. Sportier, more gathered and in my opinion, exceptional. Much like the design, the 3-series’ handling has always been one of the constants, and they have only improved it in this generation. Well done, BMW. I only drove this car in the dry and relatively conservatively, so I couldn’t evaluate any real traction benefits of the all-wheel drive system. But I was glad to see it didn’t intrude in any way. I’ve often been bothered by how Audi’s quattro likes to bind at lower speeds around corners, or while parking, and it just becomes an irritant at times. Nothing like that here. It was just invisible, which is exactly how I like an all-wheel drive system to be. Outward visibility, considering this is a relatively small and low car, is excellent. I felt the side-view mirrors were very small, but they worked fine. The exterior is nicely sculpted. I don’t think there is anyone in the world who hasn’t seen a 3-series. I think I saw a National Geographic special where they were following a tribe of cannibals from New Guinea around, and one of them had a 3-series poster in his mud hut. They are everywhere. I believe that BMW loses an inordinate amount of sleep over the design of this car, because if they were to get it wrong, it could spell disaster for the company’s bottom line. Which is why, in my opinion, they hit it out of the park every time with this series. It’s not the freshest design anymore, but it still turns heads. It still looks clean, and sleek, and muscular and dynamic. This car was the Executive trim level, and it had lovely 17″ rims on it, which are unfortunately shod with run-flat tires – 225/45-17 Continentals. No spare tire is provided with this car. I guess maybe I’m old-school, but I still prefer to have the security of having a replacement tire with me at all times, and I’m one of those guys who still knows how to change a tire in less than a day. The external proportions are correct and beautiful, overhangs are just right, and the look just works. 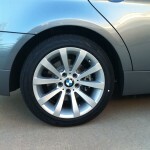 I have never talked to someone about the 3-series who had a major complaint about the design. There’s a reason you see so many of them around. The driving lights are the mild orange halos, which are nice, but somehow always seem a bit weak to me. I’ve seen blue halos on some BMWs – I believe they are just available or standard equipment on other models and it looks much more menacing and aggressive to me. That’s probably a subjective thing. HID headlights were very bright and effective, and they have automatic washers that coordinate their efforts with the windshield washer. There are little white LED courtesy lights that shine down from all four door handles outside when the car is unlocked. It looks cool, and it’s actually useful in the dark. You’ll find a sharkfin antenna on the roof, and that’s about all that sticks out. Interestingly, BMW has decided to stop putting the “x” into the model designation on the back of the 3-series, and so the only reference you’ll find to this car’s all wheel drive is the xDrive badge on the cowl. This way, you can be driving behind someone with a 328i and chuckle at their misfortune of driving a poor man’s rear-wheel drive BMW, only to pass them and discover you were wrong and they are actually loping along in the lap of all-wheel drive luxury. The interior is put together very well, from the design to the build quality. Fit and finish are exemplary, and materials are first-rate. I’ve always loved BMW materials, and this one is no exception. The dash is a nice soft, textured rubber. This car had a dark wood trim around the perimeter of the interior which went well with the dark leather and the other surfaces. The seats are covered in a firm, thick leather with beautiful grain throughout. The front seats are power adjustable and heated, the driver’s seat has 2 memory settings. I found the seats very comfortable and well-bolstered, although I think bigger drivers might find them snug. I liked the seats, but one of my passengers commented that the seats were quite stiff, perhaps more so than expected. The steering wheel is manually adjustable for tilt and telescopically and it’s also heated. Speaking of the steering wheel, it’s one of the best I’ve ever used. Small diameter, fat rim, grippy surface. Why can’t everyone get that right? I loved it! Front and center on the dash, you’ll find BMW’s excellent wide information screen controlled by the iDrive system. The screen is sharp and easy to read. I did have the misfortune of trying some of the fledgling iDrive systems, which were cause for great concern. Nothing seemed to make sense, yet you needed all the functions that it controlled. This iteration of iDrive is vastly improved, and there are direct access buttons on the console surrounding the iDrive knob. It’s still not the most intuitive system, in terms of the layout and the menus on the screen, but I don’t have the answers there either. Eventually someone will perfect this. The system includes navigation, phone integration, “office” which lets you use your messages and contacts, Connected Drive (which is essentially BMWAssist with concierge, roadside assistance, etc. ), vehicle info and settings. The center stack of buttons is clean and well-designed, not too busy and functional. I wouldn’t say that things fall into your hands, with the exception of the power/volume knob, but things still make sense at a quick glance. 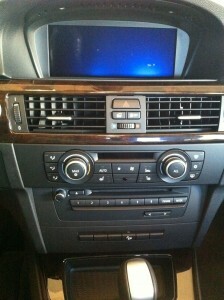 The excellent sound system has a variety of media sources, including CD, radio, iPod and auxiliary sources. You’ll find an auxiliary plug and a USB plug, as well as a 12V plug, in the center console bin, with room for very little else. The glove compartment, which is also small, has an additional USB plug and a little bin to store an iPod. When you back up, there are parking distance sensors. BMW must have felt bad for not including a rear-view camera at this price, because they give you a fake one. It’s a top view of the car (not real, just a graphic) and it shows, in colours, what might be behind the car. So if you’re backing up to something, a blob-like mass will approach your car on the screen, changing colours as it gets closer. It’s more amusing than useful, and it’s like your own little horror movie every time you back up. Yay! There is a small, irregularly shaped information screen between the two main gauges, and I found it was a bit cramped. They try to stuff a lot of information in there, and it seems pretty snug to read easily and quickly. Also, it’s BMW’s traditional amber on black, which is starting to get a little long in the tooth – everyone else has headed down the color road, and BMW should take note. All the major conveniences are powered of course – locks, windows, mirrors. There’s the typical dual-zone automatic climate control and a push-start ignition, which accompanies the keyless entry system. There IS a slot where you can stick the KEYLESS ENTRY FOB – right where you’d normally put an ignition key. It seems a bit redundant to offer a slot to place your FOB (which you don’t have to use) and then have a push-start button. Whatever. You’ll also find a nice, quick tilt and slide sunroof. Nothing big, but it’s useful. In terms of other storage – well, there ain’t much. 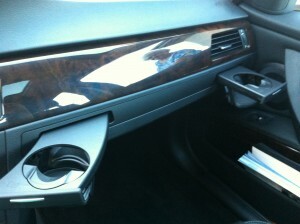 A small, open dish bin at the front of the center console, shallow door pockets (only in the front!) and that’s about it. 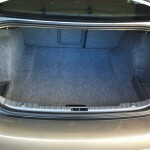 The trunk is a decent size for this class – it’ll do fine for any grocery runs or road trips. Golf clubs – not sure. Costco trip with my wife – absolutely a no-go. Frankly, my wife can fill up a minivan at Costco, so that’s probably an unfair measurement. Being a small car, you can’t expect the world from the back passenger compartment. It’s comfy back there – the seats are beautiful, and for two adults or children, they are great. That includes two children’s seats, whether infant or booster – you’ll find enough room, and you’ll find two sets of LATCH anchors. Rear-facing infant seats may be tight, as they’ll likely touch the front seats, but this shouldn’t be a surprise. The center tunnel is very intrusive, as expected, and would make life uncomfortable for any middle passenger in the back. In addition, it would make life a little more difficult for the outboard rear passengers because they’d be forced to share their decent but limited footwells and legroom. Consider it a two rear passenger car, and you’re fine. Headroom isn’t tight, but it is limited. Tall high-maintenance passengers will be seen re-doing their carefully-coiffed ‘do when they arrive at their destination. I was somewhat surprised at how high the step-in was for the back. The sill is higher than I thought it would be. If you’re a rear passenger in a 3-series, and headed out on the road, don’t take stuff with. Why? Because there is nowhere to put it. There are no door bins for any storage, and there aren’t even any map pockets on the front seatbacks. What the?! The center seatback does fold down to become an armrest, and it has two slide-out cupholders. There’s also a pass-through from the trunk, as if anyone ever uses those for skis. Other than that, there’s not much going on back there. You have a vent at the back of the center console, and a couple of map/reading lights on the ceiling. As with any car, I had some nitpicking to do. BMW has a history of putting absolutely retarded cupholders in their cars. And don’t give me the “Oh, BMW is a driver’s car – you don’t need a beverage while you’re driving one!” argument. I think their utility vehicles fare slightly better, probably because they’re built in North America, and we just don’t stand for crappy cupholders over here, do we? We NEED our 48 oz sugary sodas or caffeinated jump-starts and we WILL store them within easy reach of our flabby arms, darn it! Anyway, the 3-series’ cupholders are these weird tray-like things that swivel out of the dash in front of the passenger. Just plain goofy looking. They work alright, but they’re not convenient, and just not proper for us North American folk. Get rid of the traditional pull-up parking brake lever in the center console and put some good old-fashioned cupholders in there, BMW! I thought it was sad that BMW makes the HomeLink garage door opener an option – at this price level, it should be standard equipment, just like the rear-view camera should be. If Dodge can put them on $20,000 minivans, BMW can put them on the 3-series. I did notice a reflection on the windshield coming from the dash air vents – they are two separate vents up there, and I could clearly see their reflection for much of my driving. My final quibble is one that is becoming more common among car manufacturers and that is the placement of the central power door lock switch in the center stack of buttons. I absolutely hate that. I like it on the driver’s door panel, and it drives me nuts when I have to reach over the driver’s seat and around the steering wheel when I want to quickly unlock all the doors while standing beside the car. But that’s just me. This final detail is less of a nitpick and more of a “what in the world? !” thing. This car comes with HDC. That’s right. Hill Descent Control. As in that feature that you’ll find on off-road ready vehicles. I can see the purpose when you are off-road and would prefer technology to take over for you, to ensure you make it down a steep grade safely. Maybe I’m missing something but I can’t, for the life of me, understand why it comes on a small BMW sedan that will probably never see gravel, never mind a steep grade off-road. Can someone explain to me when I’d use technology to creep down a hill at a slightly-faster-than-walking pace in a 3-series? Maybe if you’re in San Francisco, and you habitually talk to pedestrians on the sidewalk. OK, THEN I could see it. That’s it, folks. I really enjoyed my time with the 328i xDrive. One thing that stood out to me was that there was nothing that made this car feel as though it wasn’t confident in its abilities. The driving experience was excellent, though slightly less dynamic than I expected at times. It made up for it once it got up to speed, and the handling is truly at the pinnacle of its class. I found few issues with this car, and certainly none that I’d consider a deal-breaker. The 3-series is BMW’s perennial best-seller, and for good reason – they’ve built an excellent car, designed it to appeal to the masses, maintained a great handling vehicle (even though it’s put on some pounds in the last few generations) and overall, it’s fantastic. I’d rate this car an 8.5 out of 10. I’d love to spend some time with a 335i – I have a feeling that it would be a 9 out of 10 or higher, by making the lower-speed driving feel sportier with the upgraded engine. WAF (Wife Acceptance Factor) was high – she didn’t get a ride in the car, as time was limited, but she wants one. That’s high to very high WAF in our house. Thanks for taking the time to read this review – feel free to ask any questions you might have.